This weekend, Alaska&apos;s premier sporting event - the Iditarod Trail Sled Dog Race - kicks off at Willow Lake on Sunday. On Saturday, the ceremonial start goes through downtown Anchorage starting at 10 a.m., but on Sunday, it&apos;s all business as the mushers leave the starting chute for their 1,100-mile trek to Nome and potentially, Iditarod glory. 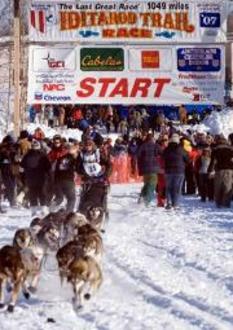 The Iditarod is one of those things that define Alaska. The race is up there with some of the most grueling events in the world - temperatures can hover at -50, the race goes across some of the most unforgiving terrain on the planet, and your only friends on the trail have four legs. The trail winds its way over the Alaska Range, through the Interior and onto the Yukon River, before hitting the Norton Sound for one last push to Nome. The starting line is the last place the trail is accessibly by the road system, and from there, the mushers are on their own. The Willow restart begins at 2 p.m., with mushers leaving every three minutes. The restart is a great opportunity to see the race up close and personal, as the mushers are just feet away from you. The Willow Community Center is open for you to warm up and get a cup of coffee or hot chocolate. The event is truly family-friendly, and kids will love to stand at the starting line, seeing the dogs and rooting on their favorite mushers - this year, will it be Martin Buser? How about a return to glory for Lance Mackey? Is this the year for fan favorite Dee Dee Jonrowe? We don&apos;t have the answers now - but we&apos;ll start to have the answers this Sunday afternoon.We&apos;ll see you in Willow on Sunday! For lots of more Iditarod information, visit www.iditarod.com. You can read up on your favorite musher, find out about the Iditarod&apos;s amazing history and even become an Iditarod Insider.